The bottom of the T-fitting has another 100mm end-cap on it. As water flows down the grow-pipe it flows into the “well” created by the end-cap at the bottom of the T-fitting. The end-cap has another centre-mounted 25mm / 1in SCH-40 PVC pipe in it, via a Uni-Seal. This is the “stand pipe” for the bell-siphon. 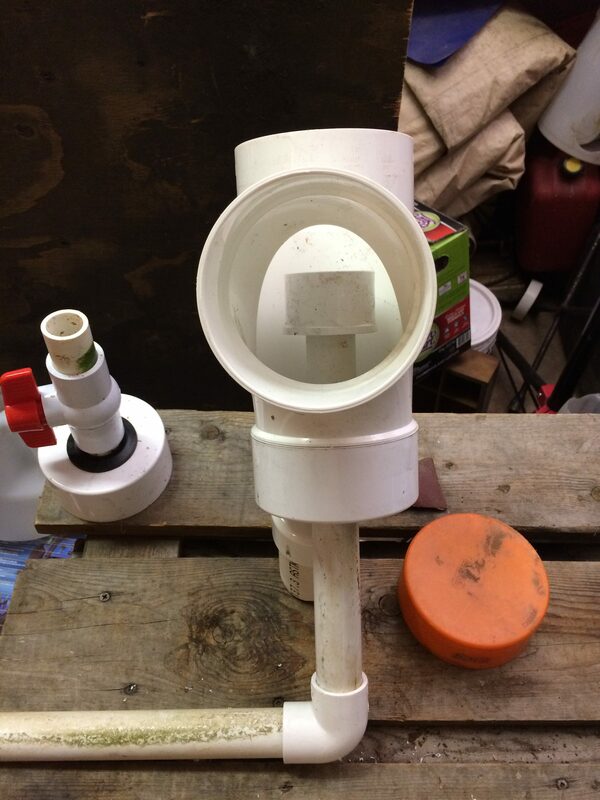 The top of the 25mm pipe has a 50mm to 25mm reducer on it, as is typical with “Affnan-style” bell-siphons. The “bell” of the siphon is a 1L clear plastic soda-pop bottle. The stand-pipe is cut to 30cm / 12in length, and adjusted up or down through the Uni-Seal to ensure that, with the reducer on it, that the water level stays at least 5mm / ¼” inch below the edges of the holes cut in the grow-pipe. This much freeboard is a minimum to ensure that water does not overflow out of the grow-pipe. It also ensures that at least half the net-pot is immersed before the bell-siphon begins to drain the grow-pipe. As noted above, water flows down the grow-pipe from the sump-end, and begins to fill the siphon-well created by the T-fitting. 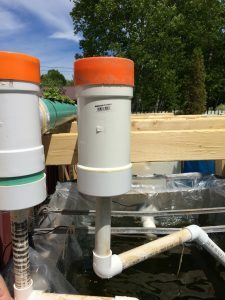 As water rises up the T-fitting, it begins to back-fill into the grow-pipe, raising the water-level evenly along the pipe. As some point in time, water has risen up inside the pop-bottle siphon-bell, and begins to drain into the reducer and then down the stand-pipe. This, of course, triggers the siphon and the entire ~20L / ~5USG volume of the pipe drains out in less than 20 seconds. The water goes down the 30cm tall vertical standpipe, and hits a 90-degree 25mm SCH-40 elbow. It then flows along a horizontally-mounted 25mm pipe, also 30cm long, until it hits another 25mm elbow. This is either 45-degrees, or 90-degrees, as required to direct the fall of water into the fish-tank below it. The out-fall streams are set to strike the water surface towards the front left quarter of the fish tank, at an angle. This gently “pushes” the water in the tank into a slow current, flowing counter-clockwise in the tank. Trout do best in moving water, and this provides a steadily moving volume of richly oxygenated water for them to swim in. It also ensures that the Solids Lifting Overflow (SLO) pipe gets a chance to pick everything up off the bottom as it slowly turns past. This entry was posted in 21c Homestead, Aquaponics and tagged Aquaponics by MichelV69. Bookmark the permalink.